As told by GSI Project Development Engineer: We have a SN wall job going on in central PA. Our client is a design build general contractor who is building a distribution center for the owner. I knew our job was finishing up soon, so I called the client on Friday to make sure he was happy. He said that both he and the owner are ‘extremely pleased’. 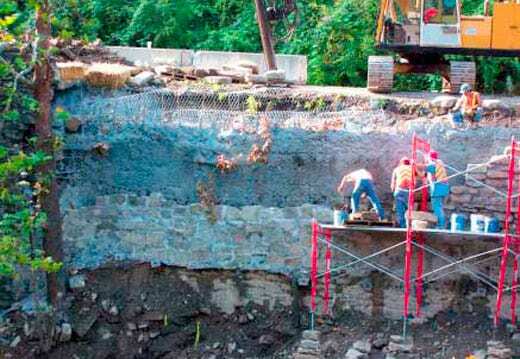 A bit of back story on this one…karst site, and the line blasting for the cut wall was done poorly to boot. So, the excavated face was very difficult to work with to say the least. The client and owner were very skeptical that we could pull off a stable wall that looked ‘good’. Well, one day when Matt Crouch and his crew were working hard on the wall, the owner was out on site with our client looking at the wall area. The owner said to our client “geez looks like these guys aren’t fazed by anything”. Given the client and owner experiences, they are used to subcontractors complaining or making excuses. Well, Matt and the guys kept their head down, went to work hard, and got the job done. The client went on to tell me later that he would recommend us to anyone.